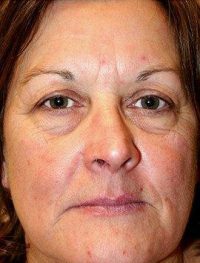 This 59 year old woman had concerns for excess upper eyelid skin that gave her eyes a sad and fatigued appearance. She also desired improvement of her lower eyelid bags as well as her skin texture and Acne. Dr. Rad performed upper blepharoplasty, and Lower Blepharoplasty + Fat Removal. Dr. Sherber performed Chemical Peel (x 3), Botox to ‘crow’s feet’ lines and to frown lines, Juvéderm to Cheeks, Eyelid + Tear Trough, and Lips + Nasolabial Folds. She also performed a series of Pearl Fractional Laser and Intense Pulsed Light. Finally, Dr. Sherber recommended a curated skin care regimen with daily Eve Lom Cleanser, Retinoid-Based Moisturizer, and prescription Acne treatment. 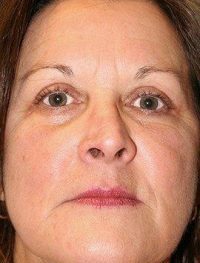 This 45 year old woman had concerns for eyelid bags, dark under-eye circles, and deflated cheeks. She desired permanent correction. Dr. Rad performed lower blepharoplasty with fat pad removal and Facial Fat Grafting to the cheeks and tear trough. Dr. Sherber performed three sessions of fractionated non-ablative 1927nm Perméa Laser treatments. This 63 year old woman wanted to prepare for her son’s upcoming wedding. She desired improvement of lower eyelid bags and dark under-eye circles. Dr. Rad performed lower blepharoplasty with fat pad transposition to the tear trough. Dr. Sherber performed one session of micro-pulsed Nd:YAG to address redness, and one session of intense pulsed light to address uneven pigmentation. This 61 year old woman had visual obstruction from severely droopy eyelids. Surgical correction involves elevating the eyelid position and, when combined with a blepharoplasty, restores a bright and rested appearance. Dr. Rad performed Droopy Upper Eyelid Repair and Upper Blepharoplasty. This 48 year old woman felt that she looked fatigued around the eyes and that her neck looked like a ‘turkey waddle.’ She had a scar on her neck from prior spine surgery through which Dr. Rad performed her neck lift (‘closed’ neck lift technique). Dr. Rad performed closed neck lift with liposuction and muscle suspension, Lower Blepharoplasty + Fat Removal.